Spetses is both cursed and blessed by its assets; being too pretty and too accessible have made it too popular. The last of the Argo-Saronic islands that include Aigina, Poros and Hydra off the northeast coast of the Peloponnesos, Spetses was so green in antiquity that it was called Pityoussa – covered with pines. Cruel winds rarely buffet it, yet every midday in summer a delicious breeze springs up to cool it. Although it has to import water, bougainvillea, hibiscus, plumbago, jasmine and trumpet vines thrive in the mild climate, spangling white walls with pink, mauve, red, baby blue and orange petals. Handsome mansions dominate the seafront between the Old Harbor (Paliolimani) and ∏-shaped Dapia, where sea taxis and kaikis huddle under cannons left from the War of Independence. Adjoining the modern jetty, where the hydrofoils dock, stands an ochre elephant of a hotel – the grand Posidonion Hotel, where Athenian gentry holidayed a century ago. Spetses is easy to get to know, superficially at least. Its only town, with about 5,000 permanent residents, stretches along the north coast from the Old Harbor, considered the classiest district, to Dapia, the port, and west to Kounoupitsa, with its more modest houses. It doesn’t take much more than half an hour to walk from one end to the other, but nobody would be caught dead using their feet in Spetses. The locals, young and ancient, male and female, are latter-day centaurs, almost welded to their motorbikes. Sometimes whole families of four or five squeeze onto one, while I’ve seen the most improbable things being carried. Most memorable was the guy wearing a canoe on his head, driving with one hand, holding it with the other, barely able to see as he bounced along a patch of stony road. 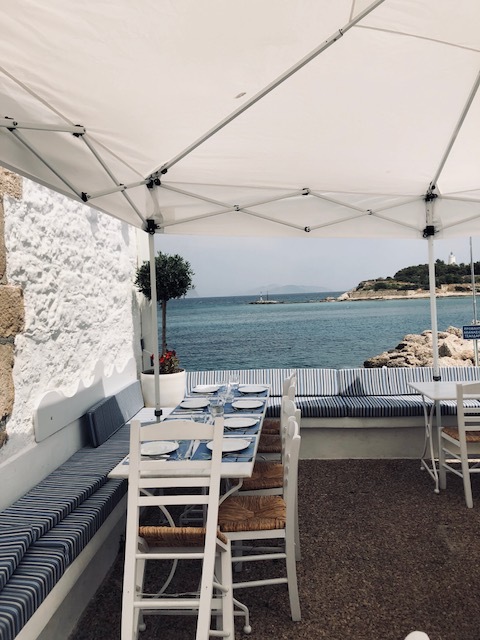 A visit to Spetses begins as you step off the hydrofoil at Dapia, which means “fortified place” in Turkish or Albanian, depending on who tells you. 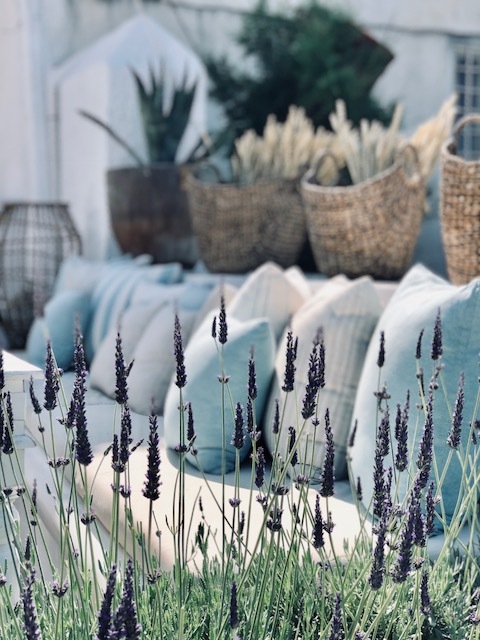 Today, it’s the center of Spetses life, where you go to buy the newspaper (foreign or Greek), do some shopping (for essentials or extravagances) and, most of all, just hang out. The cafés behind the cannon are filled day and night with non-locals nursing frappes or scoffing excellent sweets, while old timers and Spetsiotis patronize Stambolis on the upper left side. Below it are a small Alpha Bank branch, the Flying Dolphin ticket office, a well-stocked periptero (kiosk) and a gleaming new café – so new I’ve never sat there, but it looks pricey. But what about swimming? Spetses has the kind of beaches I like: more little coves hemmed by rocks than great expanses of fine sand. Snorkeling can be psychedelic thanks to the entrancing pink and mauve patterns on the walls of small caves, while at Agii Anargyri, the island’s biggest beach, you can swim into a large cave where women and children allegedly hid during at least one Ottoman raid. The story goes that their wily menfolk placed fezzes on the asphodels that grow by the hundreds near the lighthouse and frightened the enemy away. Dapia is the island’s transportation hub. Sea taxis and kaikis bob below the cafés. 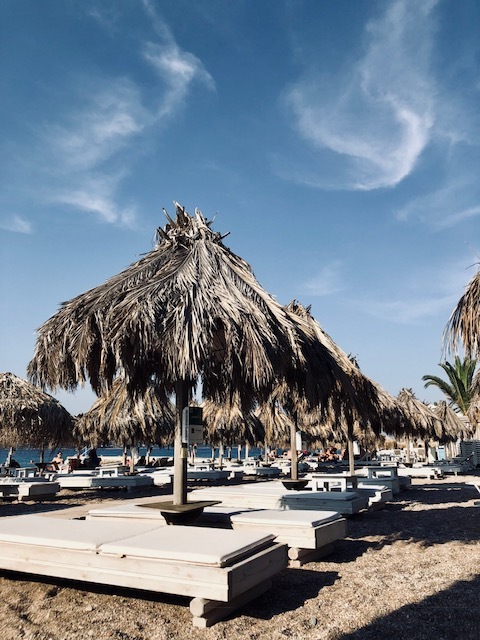 Besides taking you singly or in a group to the beaches round the island, they’ll also carry you to beaches across the straits on the Peloponnesos, starting with Kosta, which is served by an unglamorous ferry as well. Be warned: the sea taxis are expensive – 20 euros to or from Kosta – while the ferry has got to be the cheapest fare in Greece at 80 lepta (cents)! 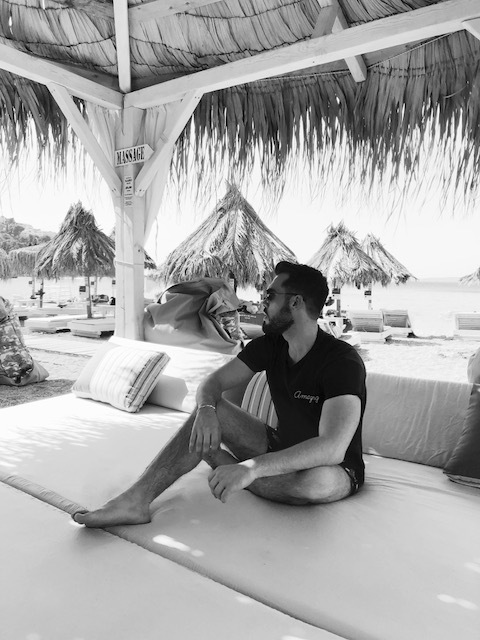 Kosta, a few miles east of Porto Heli, has a decent beach, but we drive from Athens and park the car there – cars are prohibited on Spetses from Easter to the end of October. And so do a lot of regular visitors and islanders, who balk at paying the 35 euros for a one way ticket on the hydrofoil from Piraeus. Sadly, the more economical boat that took five hours was discontinued a couple of summers ago and there are no plans to reinstate it.